I have a few vamps lists in the back catalogue. I've tended towards mono-black because I like to pretend to be 'the rack' for bad matchups, but I've played with mardu too. The big question is what payoff you are looking at. You can go anywhere from pure aggro to midrange value, and since so many of the pieces work well together, the majority of options are viable. 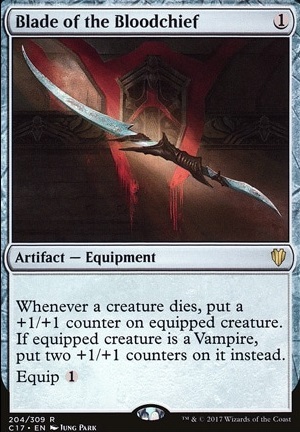 If you have even a modest collection of vamps you can always bring something fresh to FNM which plays off the same manabase and uses the same hand disruption. 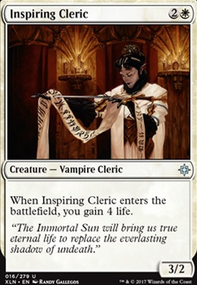 This means that there is a vamps list that will work well in practically any meta, and sitting down against vamps you could be facing almost anything from pure 'small vamps/discard/burn' aggro right up to 'solemnity/unlife/ad nausiem/blood baron'. I'm gonna try and give a quick overview of sets of cards and what they do. None of these sets are perfect, so tournament play is patchy, but some may sit in your local meta in a dominant position- use judgement and don't be scared to mix and match. More aggro really likes lords (and Drana, Liberator of Malakir ), sac engines & Blade of the Bloodchief . With all the small lifelinkers ( Indulgent Aristocrat , Gifted Aetherborn , Vampire Cutthroat do a lot). 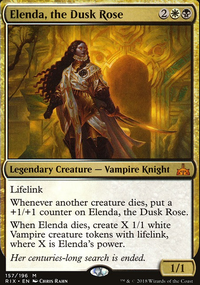 You play a very grindy game going over most aggro with lifelink and under most midrange with sac value. Card filtering makes a lot of value here, and things like Bloodghast / Faithless Looting (despite the meta being all graveyard hate all the time) put a lot of work in. 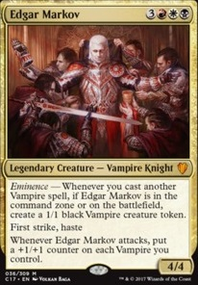 Madness vamps has Bloodghast engines and obscenities like Olivia, Mobilized for War / Haakon, Stromgald Scourge for vampire knight tribal, and similar 'high synergy/bad combo' setups can pack massive amounts of hand disruptiuon while cheap lifelink/deathtouch gums up the board. Gaining a lot of life with more disruption into cards like Blood Baron of Vizkopa / Elusive Tormentor Flip is also viable, if you are comfortable executing a more old-school control list in your meta. You also have compelling burn options- zombie infestation, sac outlet vamps and Alms of the Vein / Lightning Bolt / Gonti's Machinations does well. Human sac outlets into Falkenrath Aristocrat hits hard, but most of what it wants to do is done better by 'all vampires into nocturnus' lists the moment Mavren Fein, Dusk Apostle was printed. 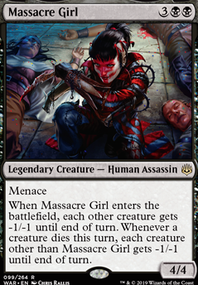 This looks super fun, as cruel as Kozilek can be. Upon light review, I was wondering about Blade of the Bloodchief as somthing thatd be fantastic with your pentavus combos, no? It also layers nicely into the Voltron setup if you you have it on some big creature, then a pentavus type combo is going off. Have you considered the combo of Ulasht, Ashnod's Altar , and Blade of the Bloodchief ? Elixir of Immortality , True Believer , and Swiftfoot Boots are fairly cheap. Lightning Greaves is also fairly easy to get your hands on since it come in pretty much every commander Precon. Tutors can never hurt if you want to go that route, card draw and finding key pieces are always relevant (I just don't run many tutors for personal reasons). If you create a lot of tokens and your deck is more token based then include Divine Visitation ! In token heavy Teysa decks it can be really powerful. Open the Armory is perfectly viable. You could also run more equipment like Blade of the Bloodchief if you wanted to go that route. If you have any more questions feel free to ask! I'm also working on a more budget build using cards from my collection, so when I finish I'll let you know if you want to see it. I'm glad you like the deck! 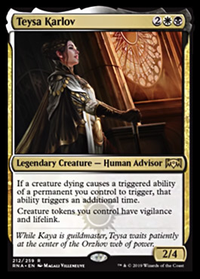 I’ve got Teysa Karlov and so much other synergy in the deck, it’s really fun to play. With the above cards mentioned I want to add so much more, like Workhorse for example. 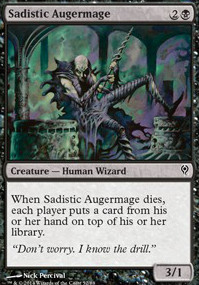 But then you look at cards like Cathars' Crusade (with hangarback walker!) or Pitiless Plunderer to fuel the token creation, there’s so many options..
Geralf's Messenger with Ashnods Altar and Ghave is a wincon that can produce infinite ... though everyone would be dead already. Unless they had a platinum angel, though Karlov of the Ghost Council would settle that. There’s great potential in combination with Mikaeus, the Unhallowed as well. Basically what I mean goldlion is that Blade of the Bloodchief is amazing on a select few creatures, other then that it is just an equipment. While I could equip it to those creatures like you said, I just find that it would kind of detract from the deck. I think I'll test it, but I'm honestly not sure how well it would do. Ya, if you're on mobile it can be a little harder to read the comments. I think it looks better on a computer though.